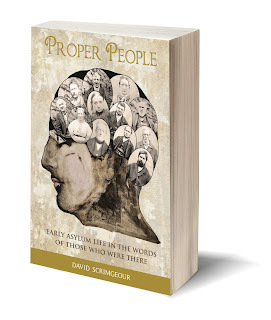 David Scrimgeour - Proper People, Early Asylum Life in the Words of Those Who Were There, enables the reader to travel back to the early nineteenth century to meet some of the mentally ill patients who passed through Yorkshire’s West Riding Pauper Lunatic Asylum in Wakefield during the first 50 years of its existence. The patients’ stories are told using the actual words of those who were there at that time. While many excellent books have been published about the nineteenth century county asylums in England, comparatively little has been written about the tens of thousands of real people, mostly “pauper lunatics”, who passed through their doors. Social historians starved of material providing a deep insight into the lives of patients have many questions to answer. Why were they in an asylum? What was their life really like? What was the impact on their families? Proper People - Early Asylum Life shines a powerful light on the lives of some 150 of the patients admitted to the West Riding Pauper Lunatic Asylum latterly known as Stanley Royd Hospital, in Wakefield, Yorkshire between 1818 and 1869. Using transcribed extracts from the celebrated collection of surviving patients’ case notes, other original asylum records and contemporary newspaper reports a picture of early asylum life is painted using the actual words of the asylum physicians, attendants, poor law officials, magistrates, asylum visitors, press reporters, patients’ families and, on occasions, the patients themselves. The result is a fascinating collection of personal sketches allowing the curious historian to patch together life as an asylum patient. 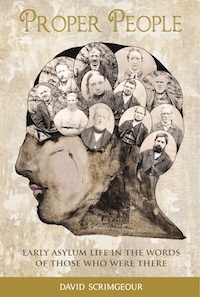 Over 60 images include rare patient photographs, samples of documentation from the archives and other complementary material sourced mainly from West Yorkshire Archive Service, the Mental Health and Thackray Medical Museums and Wellcome Library. The primary content is split into five chapters, each covering a decade since the opening of the Asylum and containing material relating to the patients admitted during that period. A glossary of medical terms and treatments helps the reader to better understand the unfamiliar medication prescribed in the case notes.